Red weather alerts - meaning there is a risk to life - have been issued in south-west England and South Wales, as Storm Emma approaches. It will meet the "Beast from the East" weather front, which is causing major disruption in northern parts of the UK. More than 300 people are still stranded on amotorway in Scotland in freezing temperatures after spending up to 17 hours in their cars. Hundreds of schools are closed in south Wales, southern England and Scotland. Storm Emma is expected to bring blizzards, biting winds and significant travel disruption to southern, western and central England, parts of Wales and Northern Ireland. This is the third day of disruption caused by heavy snowfall. 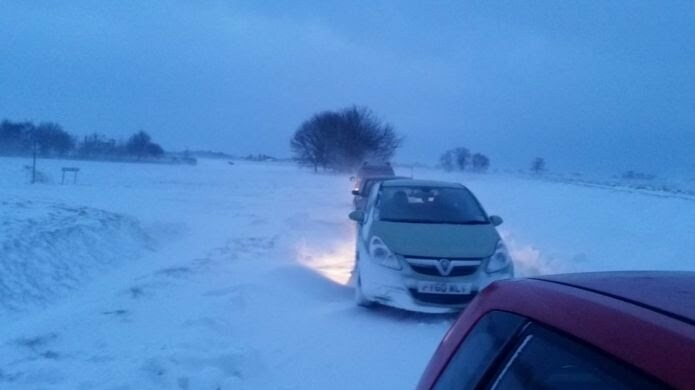 In Lincolnshire, drivers have been stranded overnight on the A52 between Boston and Skegness. A red warning for snow is in place in Scotland until 10:00 GMT. An amber warning for Scotland and northern England will last until 18:00. Across the UK, more than 20 rail operators are running a reduced service. National Rail is reporting mass disruption in the South East, Scotland, the North West and the South West. Glasgow Airport has said there will be no incoming or outbound flights until 15:00. More than 200 passengers spent the night in the terminal. The Red Cross brought cots, blankets and supplies for the stranded travellers. Edinburgh Airport announced that it would be shut until at least 10:00 because it did not have enough staff "to run operations securely". East Midlands Airport has also suspended flights in order to clear snow and ice from the runway. Traffic on the M80 between Glasgow and Stirling was brought to a standstill for several hours on Wednesday and overnight into Thursday, as emergency services dealt with a series of accidents. 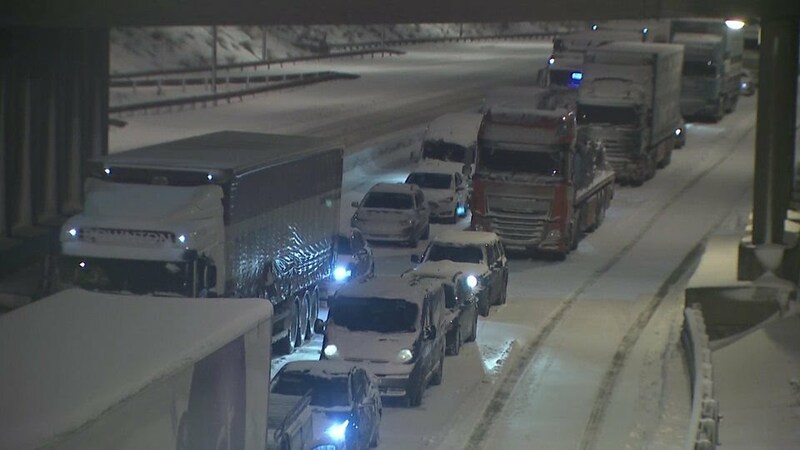 Image captionNicola Lee, who was been stranded overnight on the M80, told the BBC it was like sitting in a car park. 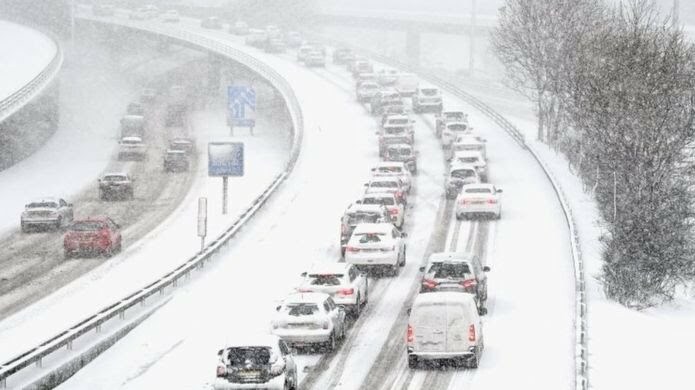 In the early hours of Thursday, drivers reported still being stuck on the M80, which is closed in both directions between Junction 8 and Junction 9, and on the M876, which is closed to northbound traffic after Junction 1. Those stuck in their cars told of people handing out food and extra blankets to those who were stranded overnight. In Lincolnshire, military vehicles were brought in on Wednesday night to help rescue stranded motorists. Snow ploughs have been unable to reach nine vehicles stranded on the A52, which police say has become impassable. BBC Radio Lincolnshire reported that farmers used their tractors to help some stranded on other sections of the road, who were taken to a relief centre overnight at Skegness Fire Station. All rural services run by Stagecoach East Midlands have been suspended and police said all major routes across the county were blocked by either snow, cars or HGVs. A further amber warning for snow and ice will be in place for London and the south east, south-west England, Wales and the West Midlands from midday until 08:00 on Friday. The Met Office said there were signs the cold easterly flow could last into next week and possibly into the following week. There could also be freezing rain for a time on Thursday night - "a relatively rare weather phenomenon in the UK," he said. More than 700 schools across Wales have been closed , mainly in the south Wales area, as Storm Emma sweeps in. BBC Weather's Ben Rich predicted "blizzard conditions" by Thursday evening across the south west of England, Wales and parts of the Midlands. He said a "biting easterly wind" will make it feel like -11C (12F) in Birmingham and Cardiff - on what is the first day of meteorological spring. The Met Office said some areas of Scotland could see up to 30cm (11.8 inches) of snowfall and possibly up to 40cm (15.7 inches) in "a few places" by mid-morning. There is potential for up to 50cm (19.6 inches) over parts of Dartmoor and Exmoor, the Met Office added, with up to 20cm (7.8 inches) falling in southern England, Wales and the West Midlands.